“Athletic competition is an important part of the Howard experience, and this new logo is evidence of our commitment to excellence in sports alongside our pursuit of excellence in academics and research,” said President Wayne A.I. Frederick. 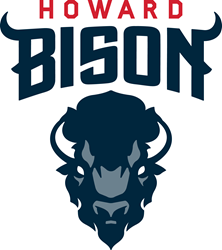 Howard University Athletics unveiled new Bison logo, the symbol of strength, power and tenacity that guides the University’s athletic teams during today’s press conference. Chief Brand Strategy, the firm chosen to direct the process, incorporated those ideas in developing a set of draft designs. The final product presented today comes from several months of focus groups held on campus and through social media that included Bison athletic administrators, coaches, student-athletes, faculty, staff, campus marketing team members and alumni. Over the next several months, the logo and the associated wordmarks will become integrated across the athletic department and with the assistance of the University administration, become part of the institution's marketing and promotional materials.